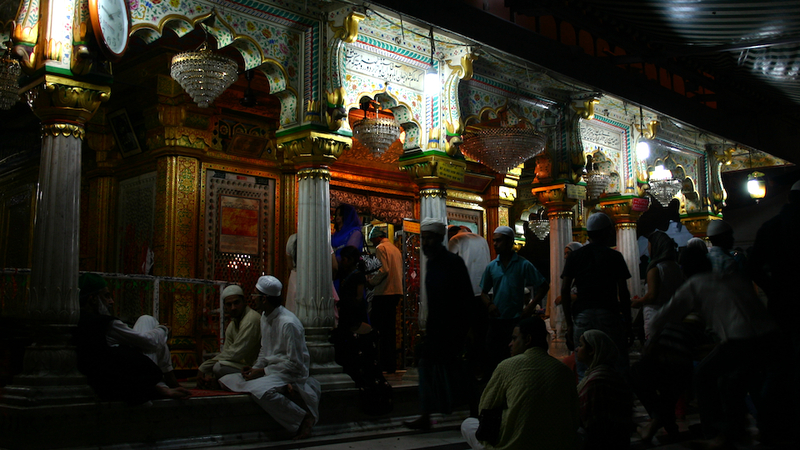 Thursday night at the entrance to the dargah of Khwaja Nizamuddin Auliya. Another long standing wish (thanks in no small part to the writings of the Delhi Walla) was fulfilled earlier this month when I got to visit the Hazrat Nizamuddin dargah. I’m yet to put the experience down in words, but I’m certain additional visits will set that right. Thankfully, others have gone before me and paid worthy tributes to the shrine of this Sufi saint. So, enjoy the sights and sounds of the dargah in this beautiful still image video titled ‘In the Courtyard of the Beloved’, read about a passing observer’s observations or close your eyes and let Rahman’s homage ‘Kun Fayakun’ take over you. Thanks. I was a bit surprised with the variety of colours myself. The dargah at Fatehpur was quite minimalistic in its palette, but Nizamuddin turned out to be a wonderful splash of greens, reds and whites. Oh and that video… I’m yet to get over even the title—In the Courtyard of the Beloved. So good. The Colours say it all. Those chandeliers are quite an unique add on for a shrine, which I doubt we’d see in most religious places of worship, although it would be nicer to see it lit. Also, I’m still in love with how the first half of that video was done. Oh oh. I’ve always wanted to know how it is inside. These photographs are beautiful. I like how the islamic architecture has so much detail in it. I’d like to read about your experience.. Interesting. Detail in old [Indian] buildings is hardly limited to Islamic architecture, but this one is particularly interesting since the dargah is still in use. 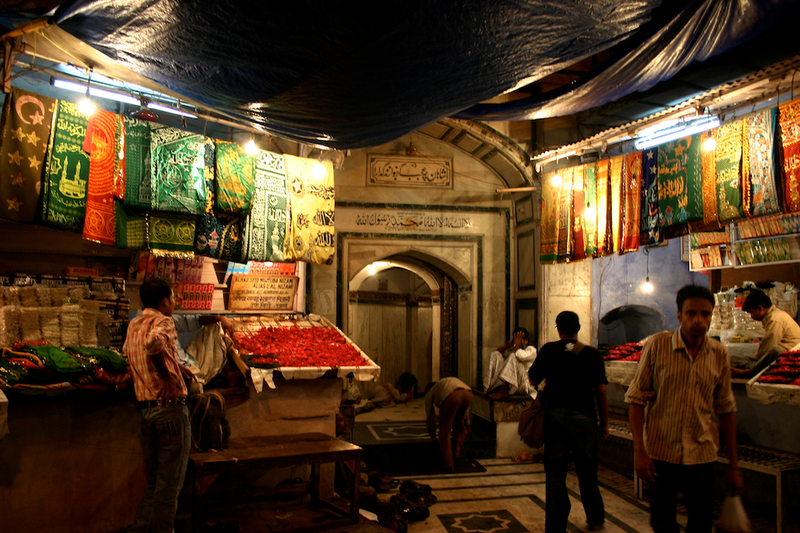 The colours, chandeliers, cloth hangings and most other features that stand out were probably not unique to this lone dargah. Contrast this with any of the old Islamic monuments. Colourless but for the build material, completely unadorned, unfurnished. Slowly we start to see just how much existential detail was lost when these structure fell out of use.